If you have plan to invest an automatic professional washing system,the investment must ensure the right capacity, reasonability and can extend services later. This will help you to maintain the stable operation of factory and aims to create long-term brand. Investment in small machine is better than the large machine because the waiting time to have enough clothes for 1 batch washing in the small machine is faster,thus you can save maximum time and the investment cost. - With the drying system using steam, rate capacity dryer / washer is 1/1; with electric heating system, the rate is 1.2 / 1. - Drying system use electric: low investment cost, compact texture, very suitable for small laundry shop. - Drying system using steam: high investment cost, require large surface,suitable for large laundries. With laundry needs for residents sector, need of people mainly is clothes, blanket, pillow, stuffed animal ...Laundry services include three components service mainly "wet washing", "dry washing" and " steam ironing". - Wet washing: wet washing machine, washer extractor are indispensable in a laundry shop; the formula and the chemical quantify, dryer. - steam ironing : steam iron by hand, steam press irons, dry press irons, mushroom irons, neck - sleeves irons, former. Service depend on the needs, mainly "wet washing", "industrial washing" and "steam ironing" with the kind of laundry: clothes, pillows, blankets ... From there, choose laundry devices in order to fit with the requirement. - Meeting the needs of the present (current capacity). - Can be expanded in the future. Depending on the investment, the size of the laundry facility and the professionalism that require devices and the number of devices for a laundry shop. 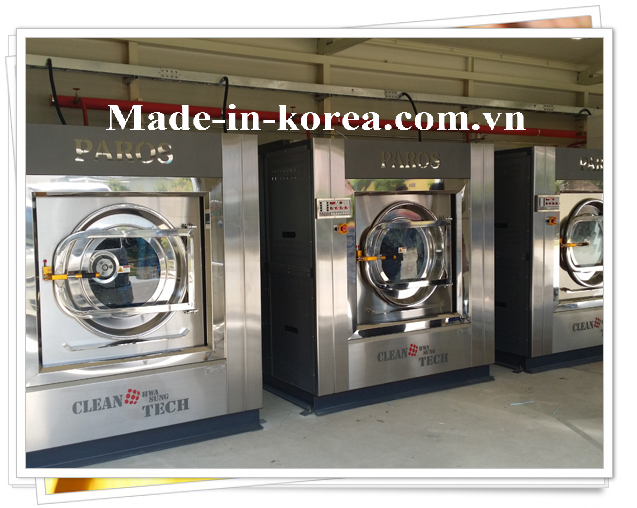 1 - Industrial Wet Washing Machine Hwasung Korea Industrial capacity 25-30 kg / batch dry clothes. 2 -Industrial Dryers Hwasung Korea capacity 25-30 kg / batch dry clothes. 6 -Remover stain Machine ( point remove). It is possible to calculate the engine capacity power accordingly. Volume of clothing from 3-5 sets / kg, so each batch can be washed at the same time from 75-150 sets per day and washable per day from 750-1500 clothes. Volume of blanket between 3-5 kg, each batch can be washed at the same time from 6-8 blankets and every day can be washed from 60-80 blankets. Volume of blankets from 1.5 to 3 kg, each batch can be washed at the same time from 10-20 rooms every day and washable from 100-200 rooms. Volume of blankets, curtains between 3-5 kg, each batch can be washed from 6-10 rooms every day and per day can be washable from 60-100 rooms.